Lovers, to the left we have Black Halo’s tres chic Classic Jackie O Dress; to the right we have ModCloth’s sassy Style Me Now Dress. Though the Style Me Now Dress is a nautical navy hue, as opposed to the black shade of the haute Halo; for a mere $64.99, in comparison to the $345.00 needed to add the Black Halo beauty to your flirty frock collection, it allows one to add presidential style to their wardrobe – on a frugalista budget! Tell me, kittens…will you be a big spender and go for Black Halo, or be thrifty and spring for ModCloth? Thanks to Revolve Clothing and ModCloth for the pictures. Don't forget to enter the Style ABC’s Giveaway for your chance to win a copy of Joe Zee’s The ELLEments of Personal Style: 25 Modern Fashion Icons on How to Dress, Shop, and Live. Don't forget to enter the Yves Saint Laurent and Apothica Love You Giveaway for your chance to win a $50.00 Gift Certificate to Apothica. AMAZING find! but I am so not the big spender! definitely the $64.99 is more in my range :) have a great day! I really like the ModCloth version. That Navy Blue is awesome, as is the shorter hemline. Have a good day, E.
It'd have to be the Black Halo. I can't imagine channeling Jackie O on a budget. Better fabric and the longer hemline is a necessity. I love it when you do these posts! I like the modcloth due to the shorter hemline. OMG!! I heart you!! I've been eyeing this Halo Dress since I saw Amanda wear it on Ugly Betty! Not to mention, I love how the Halo dresses look on pear-shaped gal (like America Ferrera)! So I'm stoked that you found a less expensive alternative!!! That's a great price for that Halo dress. Just what's needed for all those party-times and what not. I've been a big fan of ModCloth lately! such an interesting company with cute clothes. such a sweet dress for so many occasions. I'd go for the cheaper one. of course. Definitely the Black Halo on this one. For me, I think it looks much better with that longer length. And it's a classic piece, a definite staple in the wardrobe. Hello Modcloth - great dress at a great price! I would def go w/ the Modcloth one!!! Erika- I love this dress so much! It screams my name!!!! I would wear it on a date, to the ballet, and perhaps just lounging around the house channeling Jackie O! I adore the modcloth dress ! I am going to ModCloth.com right now! Very classic, chic piece..perhaps worth the splurge? wow, I'm so glad you found this cool price for this dress. That dress is gorgeous. I love the ModCloth price too! i'd have to go for the black halo one, it's perfection! Completely adore the steal version. They look really close! Is the Modcloth shorter? Oh my freaking gosh. This dress. I want. Ooooooh... but that Black Halo one is so gorgeous. I kind of need it in my closet. It would never, ever go out of style. This find is perfect! Mod Cloth always has great vintage inspired clothes. We love the comparison. Great finds! Love the modcloth one! I actually like the ModCloth more! I actually have never bought anything from modcloth, but I probably would go for it instead of the pricey one. Thanks for the comment on Sara's guest post on my blog!! Nice dresses, only I think it's just a little too long. When it was a little shorter I would definitely buy it! Such elegant dresses! A definitely staple for any wardrobe. I love the Modcloth one. I feel like I must have this dress in my life, I'd take either! I think the Mod Cloth is prettier! You had me at Jackie O, Erika! 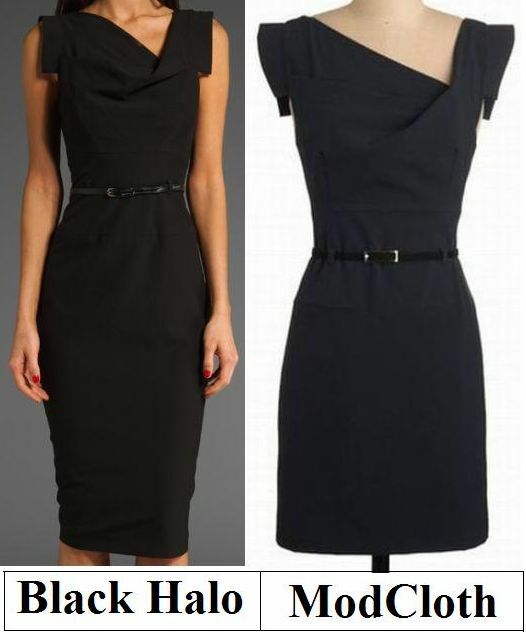 I actually prefer navy, so I'd pick the ModCloth. Oh, a perfect match! I love it. I'm glad you found this thrifty dress. I'd go with the Modcloth! that's a great deal ! i cant get enough of LBDs these days !! Stunning dresses! They kind of remind me of Roland Mouret. I think I like the navy better actually! I just adore Modcloth! i actually like the Black Halo dress better because of how it fits at the bottom. Ooo, both of these are really nice! Although I prefer the Black Halo. Very very elegant!! I'll take the steal!